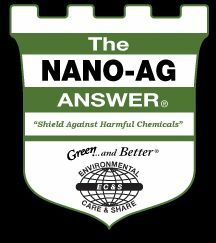 The Nano-Ag Answer® is a concentrated formulation of a proprietary blend of ingredients presented in dehydratable to the plants. When mixed & activated with water, these microbes wake up and reproduce. The Nano-Ag Answer® creates a population of BILLIONS of soil builders in just 48 hours ready to go to work in the field. With The Nano-Ag Answer® farmers can feed plants organically at the atomic level and condition the soil at the same time by giving the soil the ability to create nutrients naturally by stimulating microbial growth. Conventional fertilizers inhibit microbial growth and drive earthworms form the soil. When this happens the topsoil shrinks.The Nano-Ag Answer® restores microbial growth and the earthworms that replenish soil. Earthworms give off castings that make the soil rich and the plants absorb the nutrients--this is the simple process that builds topsoil. One microbe from The Nano-Ag Answer® creates one billion microbes in a 24 hour period that produce earthworm-like castings, thus renewing the soil quickly. When this happens, the plant products—fruits and vegetables-- look beautiful and taste wonderful because their natural sugars are restored. The Nano-Ag Answer is organic certified and ORMI listed. It is designed to wake up, energize and stimulate the naturally occurring microorganisms in your soil, plants, and water. It furnishes immediate energy to microbial life by providing high energy, natural as well as a balance blend of water soluble trace mineral electrolytes derived from 8 different carbon sources. It contains a complete system of enzymes for microorganism stimulation and replication. These enzymes also work with natural plant hormones to help plants reach their full potential..It is made from a shale, leonardite extract that is organically certified and ORMI listed. The Nano-Ag Answer’s proprietary formula contains The Bio-N-Live Answer and The Carbon Answer, two liquid formulas of which were initially sold separately in (five gallons) and had to be mixed together before application. You can now enjoy the benefits of these fantastic products in the powdered “Nano” state of The Nano-Ag Answer.